NFL draft night at Medill Reports Chicago. Photo by Scott B. Anderson, Northwestern University. 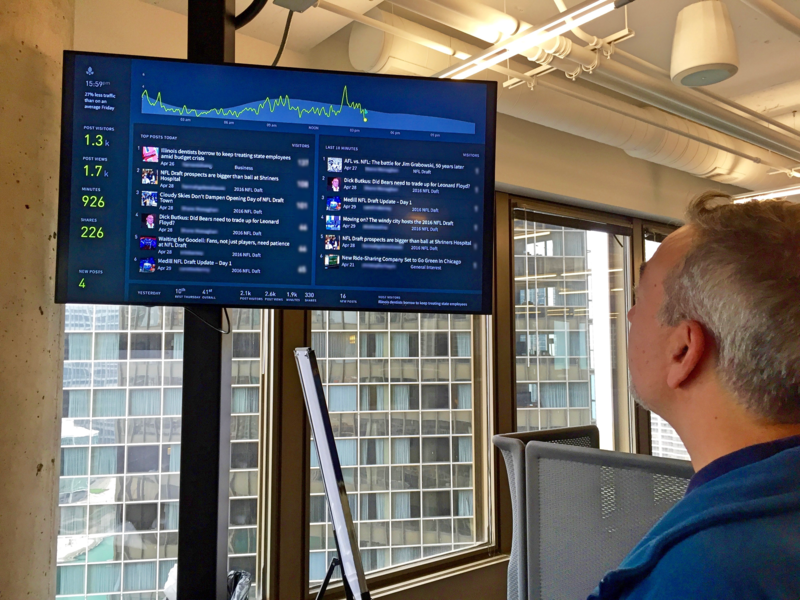 During this spring’s NFL Draft in Chicago, graduate student reporters at Northwestern University’s Medill School of Journalism, Media, Integrated Marketing Communications had their eyes fixed on two screens: one tracking draft picks and the other, a newsroom monitor, showing real-time audience analytics for their site, Medill Reports Chicago. Both provided plenty of fodder for conversation: Was it smart for the Bears to trade up for their first-round draft pick? Why was a Medill reporter’s post about the trade attracting attention, along with posts on a checkers-playing wide receiver, the fate of the Oakland Raiders franchise and the draft dreams of J.J. Watt’s brother? Was a tweet from the NFL’s vice president of football communications with a link to a student’s story driving traffic? For Scott B. Anderson, an assistant professor at Medill and managing editor of Medill News Service and Medill Content Lab, the audience metrics raised a different question, one facing many college newsroom instructors: What is the proper role of analytics in the newsroom-as-classroom? Read the first part of this series on the different approaches j-schools take to train aspiring engagement editors. Using analytics can help students evaluate and improve their journalism. But it can also throw up roadblocks through low readership numbers, chasing metrics before grasping the basics of reporting or making broad assumptions from limited data. The result is that college newsrooms — training centers, outlets of record and content distributors — are still debating what audience engagement metrics and other measures of impact to use. Medill Reports Chicago, part of the Medill News Service, is like many university-operated, student-powered publications. It exists to showcase student work and highlight the school’s teaching hospital training. Professors who run these outlets aim to replicate a professional newsroom — except, in many cases, when discussing audience metrics. That, many professors say, is their goal — teach students about the importance of engagement metrics and making an impact without overstating the need for their relatively small, niche news organizations to attract huge audiences. Jessica Pucci, a professor of practice at Arizona State University’s Walter Cronkite School of Journalism and Mass Communication, has a nuanced message for students. In fact, few university-run newsrooms face external pressure to report their numbers. At Capital News Service, the news organization operated by the University of Maryland’s Philip Merrill College of Journalism, page views are not the most important audience metric, said Sean Mussenden, director of the CNS Digital Bureau. He prefers advanced measures of engagement such as share of returning visitors, time spent on site and social media traction — and he wants students to think critically about what metrics matter most to them. The most common analytics tools used at universities are Google Analytics and Chartbeat, which charges a monthly or yearly fee. This fall, Capital News Service plans to add another platform to its arsenal: Parse.ly. The service, which typically costs money, is free for Maryland and other schools (including Northwestern, Arizona State and the University of Florida) as part of the University Partners Program, which began with four schools last fall, grew to seven in the spring and will reach 13 schools by fall. Ben Probert, who runs the Parse.ly program, said the idea is to provide independent student publications and university-operated news outlets access to its dashboard so that faculty and students can discuss what metrics are most important to track and what they learned from analyzing audience data. Schools must report these findings at the end of the semester, and this fall the schools with the top projects will be rewarded with an invitation to extend the free partnership. Projects already published on Parsely’s website reveal the range of data that universities have sought to gather, including the days and times that are best to publish articles and social media posts, the ideal story length for reader engagement and how social interactions and social referrals impact website traffic. Pucci, who participates in the University Partners Program, advises students to focus on different audience data depending on the publishing platform and story type. Scroll depth is important for stories with graphics, she said, while Nielsen ratings and YouTube views matter for broadcast stories. Quantitative metrics are not the only way for student journalists to measure audience engagement. Jere Hester, director of news products and projects at the CUNY Graduate School of Journalism, encourages students to think about whether their stories have — directly or indirectly — made an impact on the communities they cover as beat reporters. “If we declare victory, it’s going to be where our stories brought action,” said Hester, who runs NYCity News Service, CUNY’s primary outlet for student work. One such victory came in 2014, when student reporters teamed with New York Daily News reporters on a three-part series about how the city failed to respond to mold complaints in public housing. The articles sparked a city council hearing, a city investigation that confirmed the reporters’ findings and the appointment of a “special master” to oversee the city’s response. One of the ongoing debates at CUNY is how the curriculum should address the variety of ways to measure this kind of real-world engagement and impact. Brown encourages students to interview people from the communities they cover about what impact the stories had on them. Elsewhere, however, that kind of data is only anecdotal and not systematically gathered. Similar limitations apply when measuring offsite metrics. When stories are republished, how do audiences engage with that content and what kind of impact does it have? It’s an important question for university-operated news services that regularly feed student work to news outlets with a much broader reach, but also a question no one can answer. At Cronkite News, the inability to track offsite analytics is “probably our biggest pain point,” Pucci said. She uses Google Alerts to tracks which media outlets run student content, but some outlets do not link back to the original story (they aren’t required to) and she has no systematic way of gauging how her reporters’ stories perform on other news sites. Matt Sheehan, director of stories and emerging platforms at the University of Florida College of Journalism and Communications, agreed that tracking the offsite performance of stories is “not an easy bridge to cross.” The college’s model of “report once, publish everywhere,” means that student work appears not only in college-controlled media properties but also in outside news outlets. Tracking media pickups of CNS stories is not an exact science at Maryland’s Capital News Service, either. Mussenden uses a mixture of news alerts and personal communication with the 40-plus news organizations that run students’ stories. Nor is there an way to track offsite for those in the University Partners Program. Parse.ly provides plenty of on-site data but is limited in the outside data it can collect. Medill students covering the NFL draft on draft night. Photo by Scott B. Anderson, Northwestern University. What’s the Real Goal for University Newsrooms? The reality is that for many schools, the teaching hospital model is first and foremost meant to give students experience in a working newsroom. That’s the measure of success. Attracting huge audiences is secondary. Mussenden and other professors said they try to focus on the data they have rather than lament the data they could have. “The reality is that for many schools, the teaching hospital model is first and foremost meant to give students experience in a working newsroom. That’s the measure of success. Attracting huge audiences is secondary.” I’d be interested in knowing the source of this statement other than “the reality.” In the reporting class I teach at Missouri, we really do “bake into” the reporting class in the Columbia Missourian newsroom an early-stage identification of potential audiences for every story. Students are graded in part on how well they do that. And how intelligently they share their work. A true “teaching hospital model” newsroom is supposed to serve a community or communities. I don’t see how any journalism school can lay claim to being an adherent of the model without begin passionately interested in teaching students to be constantly aware — at every stage of their reporting — of audiences.